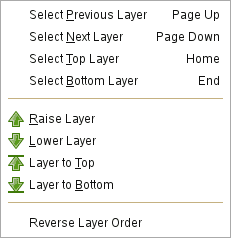 The layer stack is simply the list of layers in the Layers dialog. The Stack submenu contains operations which either select a new layer as the active layer, or change the position of the active layer in the layer stack. If your image has only one layer, these commands are grayed out. You can access this submenu from the image menubar through Layer → Stack.